Day 11 was the last day of our U.S.A. and Canada tour. 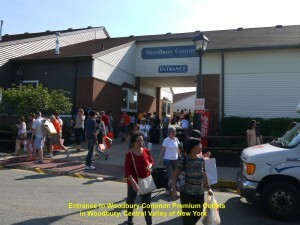 At 8.30 in the morning we left Renaissance Woodbridge Hotel in Iselin in New Jersey and travelled 80 km north to Woodbury Common Premium Outlets in Woodbury, Central Valley of New York. 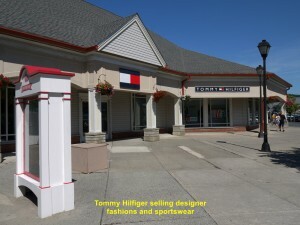 Opened in 1985, it has now 220 stores selling designer fashion clothing, footwear, luggage, accessories, jewellery and other goods. 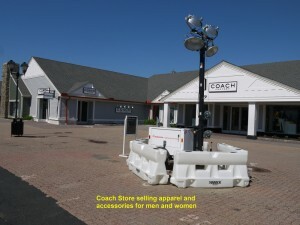 Most of the goods carry American brands like Levi’s, Coach, Tommy Hilfiger, Hush Puppies, Calvin Klein, Timberland, Polo Ralph Lauren, Guess, DKNY, Tory Burch and many more. 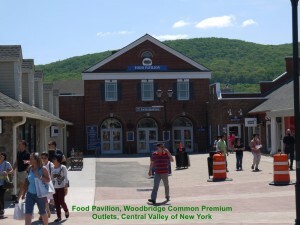 It was a sunny day when we entered the shopping place. 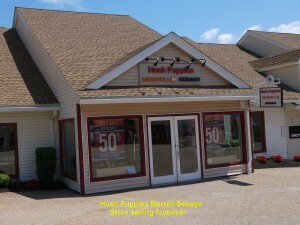 As it was Monday there were not many shoppers around and it was a good day for us to shop. 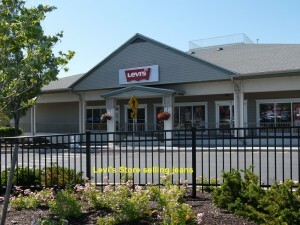 As there are so many stores in the large area, they are built in a few zones. In each zone the roofs of the stores are painted with the same colour so that visitors can identify the zones, easily. During lunch-time we had our meals at the Food Pavilion. After lunch, we continued looking for bargains at the remaining stores. 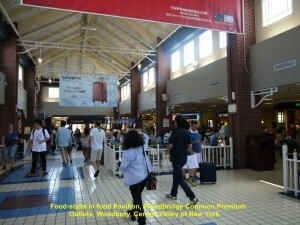 After spending almost the whole day at the Premium Outlets in Woodbury, we left at 5 p.m. and travelled on a busy highway to John F. Kennedy International Airport. 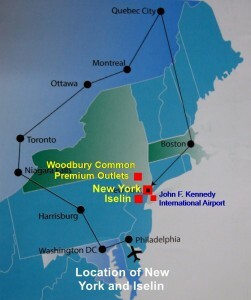 The airport is about 120 km south of Woodbury. 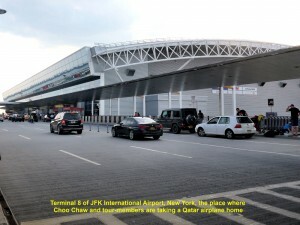 Terminal 8 of John F. Kennedy International Airport, New York, U.S.A.
Two and a half hours later, we arrived at the airport. Before we got into the airport, we hugged, thanked and said farewell to our super American coach-driver, Roanne, who had, diligently and carefully, driven us to so many places of interests in U.S.A. and Canada for about ten days. Frankly speaking, it was an emotional farewell moment for most of us. Inside the airport, we checked in and got our air tickets. 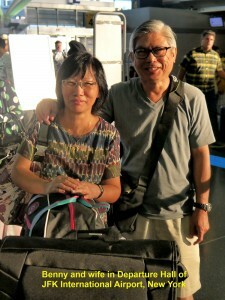 All of us were happy to go home to see our loved ones soon after over ten days touring in U.S.A. and Canada. 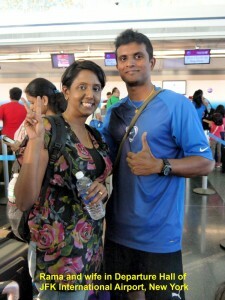 In the departure hall, I took out my camera and took photos of some of my tour-members who have become my friends. 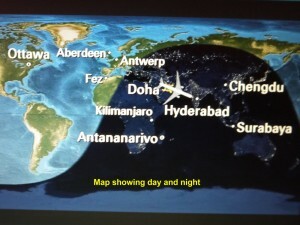 At 10.10 p.m. we boarded a Qatar airplane of model B777-300ER, left JFK International Airport and flew all the way to Hamad International Airport in Doha, Qatar, without stopping. 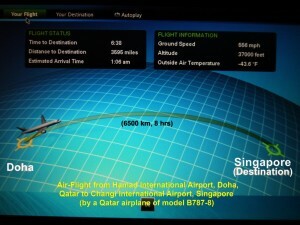 It took almost 12 hours to travel a distance of 10 800 km from New York to Qatar. Of course, it was uncomfortable to stay in the economy class on the plane for so many hours. 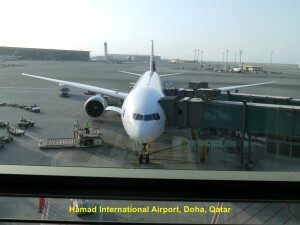 When we arrived at the Doha airport in Qatar we stayed at the airport and waited for another Qatar plane to fly us to Singapore. 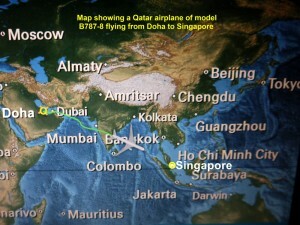 Finally, three and a half hours later, we boarded a Qatar plane of model B787-8 and departed for the next and final destination, Singapore. 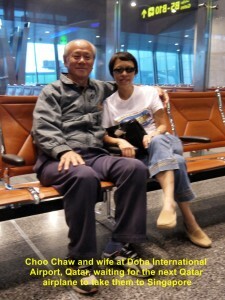 At 9.15 a.m. on Tuesday, 24 June 2015(Singapore time and date), we, finally, arrived at Changi International Airport, Singapore, safely. 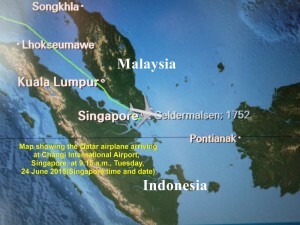 It took almost 8 hours for the plane to fly a distance of about 6 500 km to reach Singapore. 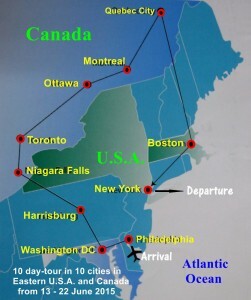 Well, that is my unforgettable tour in east coast of U.S.A. and Canada. My new friends will remember it for a long time, too. Thanks to all who have made our tour possible, including the tour manager, Andy Yuan, American coach-driver, Roanne, EU Holidays Pte. Ltd.(Singapore), and Irama Travel & Tours Sdn. Bhd. (Johor Bahru).